Intelligent Quarantine™ (IQ) is a key feature of our brand new Inbound Email Filtering solution. MailChannels IQ™ allows both senders and receivers to release messages that were quarantined by our system, instead of silently filing them away into the junk folder where they can potentially be lost forever. With MailChannels Inbound Email Filtering, spam management per domain is simple and effective. Each mailbox user has their own login credentials where they can set their own spam policies and manage their whitelist and blacklist. Meanwhile, domain admins can set spam policies across the domain, without having visibility into the private details of individual users' messages. MailChannels Inbound Email Filtering directs email traffic through a series of analysis and filtering steps to identify the responsible sender, analyze message content, assess sender behavior, and then apply an appropriate rate limiting or blocking policy. Similar email is then grouped into pools for further analyses that are optimized for that type of traffic. 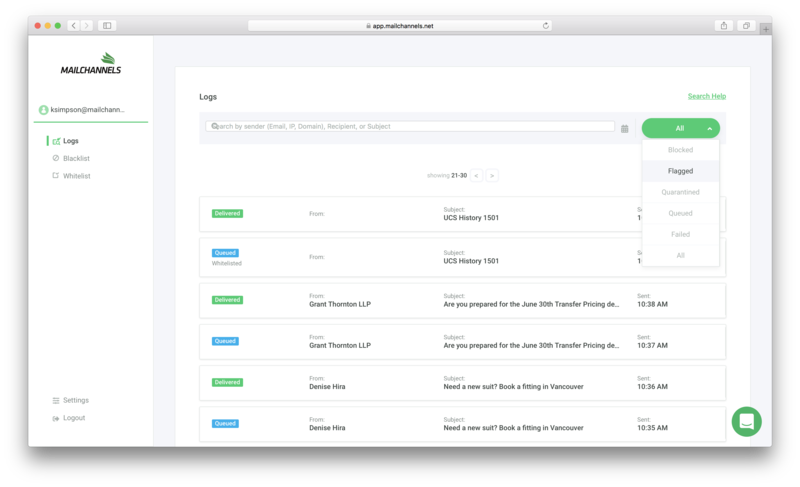 With our simple, user-friendly interface, a log of emails with a drop down menu displaying viewing options of all email, blocked, flagged, quarantined, queued and failed can be seen. 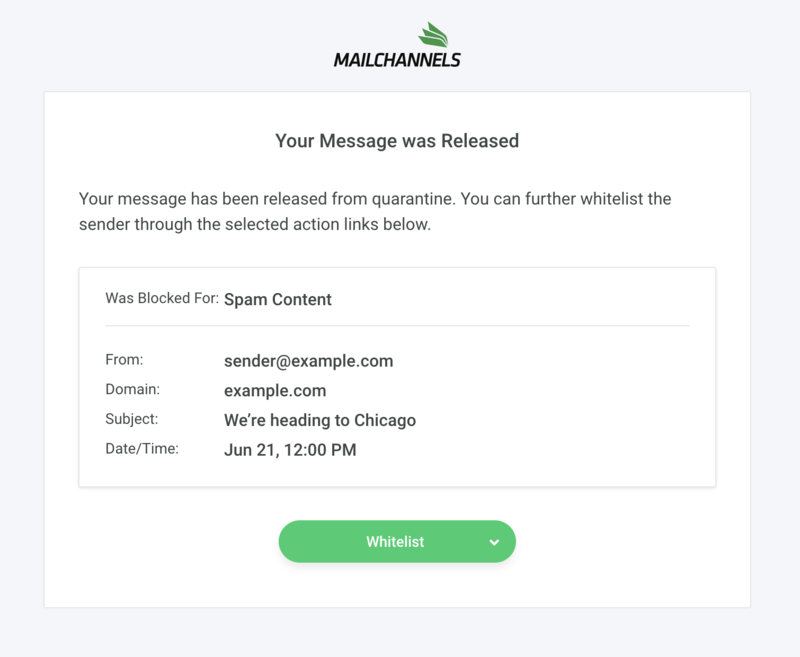 Users can choose to see the emails that have been quarantined by MailChannels IQ™ and whitelist or blacklist the sender. For web hosts who manage email, reliable email delivery for customers is imperative. Email that is incorrectly flagged as spam and sent to the junk folder causes frustration for customers. MailChannels IQ™ eliminates this frustration by empowering end users to control their own inbox. The Quarantine Digest gives users an overview of emails that have been quarantined by our system with details such as the sender, the subject line and the date and time the email was received. Users can opt for a daily or weekly Quarantine Digest to be sent to their inbox. The digest allows users to view their quarantined messages without needing to log in to the system. It also allows messages to be released straight from the email. Once a user releases an email through the Quarantine Digest, they will be asked if they would like to whitelist the sender. The Quarantine Digest shows users a log of their quarantined email. Users are given the option to whitelist a sender once they release an email through the Quarantine Digest. Along with MailChannels IQ™, our Inbound Email Filtering customers can feel secure knowing that, should anything go wrong, they have support from MailChannels specialists 24/7, with a guaranteed reply within 30 minutes.